Nissan's compact Sentra for 2017 continues a 35-year tradition of offering loads of features in a sporty 4-door that is a cut above the typical small sedan. Inside, the Sentra is not all that much smaller than the midsize Altima, and it offers a number of different personalities ranging from economical basic transportation to an amenity-filled mini-luxury car. Great gas mileage as well as 6, 000 miles between oil changes. Until now we bought or leased u. S. Cars only. We heard that several foreign cars had better gas mileage; some dealerships provide better service; and some gave more incentives, including the Nissan dealership nearest to our house. So, we tried a new Nissan Sentra 10 months ago and we are very pleased with its overall performance. Traveling to Florida (from Michigan) we boasted a 37. 4 miles per gallon gasoline, much more than any previously owned vehicle. Also, though it is a basic model, we are delighted with the smooth ride, comfortable seats, and turning radius. Only 10 months old we have not had any problems to report (it is a 3 year lease, so time will tell). However, when purchased a tire warranty when we signed the initial lease and sure enough, we had a puncture on the sidewall. Would the warranty cover that? A resounding yes! Finally, we were excited to hear that our first oil change was free and, instead of the usual 3, 000 recommended miles between oil changes that we were used to, the Nissan Sentra needs the oil change every 6, 000 miles! So, needless to say, we are extremely happy with this vehicle. In fact, we are looking forward to leasing another Nissan when this lease is up. Best zippy car for someone on a budget. I went from a wry to a Sentra sr turbo. Exact same power as the Nismo version but minus the extra branding, sport seats, limited colors, and red trim. I didn't consider those important. It does 0-60 in less than 7 seconds. Rides smooth and provides comfort for long drives. Only minor complaint is the wiper blades will not lift completely off the windshield (like for prepping for snow and ice). The hood of the car actually prevents them from lifting more than an inch or so. Trunk is roomy. I like to fish and it is deep enough to fit my 4. 5-5' poles diagonally with minimal bending. Definitely recommend this for someone on a budget looking for nice features. Also, fuel efficient! Uses regular and I get 26 mpg city with a lead foot! 42 Highway! 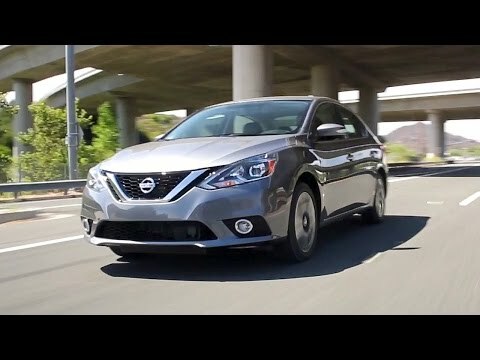 Best car ever hands down Nissan Sentra 2017. I am pleased with my Nissan Sentra 2017! I have not had any issues or problems with it which is what I am most proud about. My past cars I had issues with within two months and this car I have had for seven months. It feels good to be able to depend on a car to get you places and not having to worry about getting something fixed each week. I am the primary driver so I can not say how it feels to be driven around in my car but driving it is comfortable. I sometimes forget if the car is on or not because of how quiet it is. I do not have to take my eyes off the road to change the station because I have my playlist on my phone now and I can skip forward or backwards right from the steering wheel. I love it!